The Week 8 challenges for Fortnite season 7 are here, and it might be a bit tough to focus on the challenges this week. Why? The Fortnite map is in the midst of an ice storm (Fortnitemares-like zombies are back) and sneaky snowmen are creeping around! So, it’s a good thing we have all the challenges laid out for you below, along with a guide on how to quickly solve the “search between” task. Find the rest on our blog! We didn’t think it was possible, but the challenges are even more straightforward than last week’s. The most difficult task this week is locating that Battle Star between 3 strange locations, so we’ve put together a guide for that below. 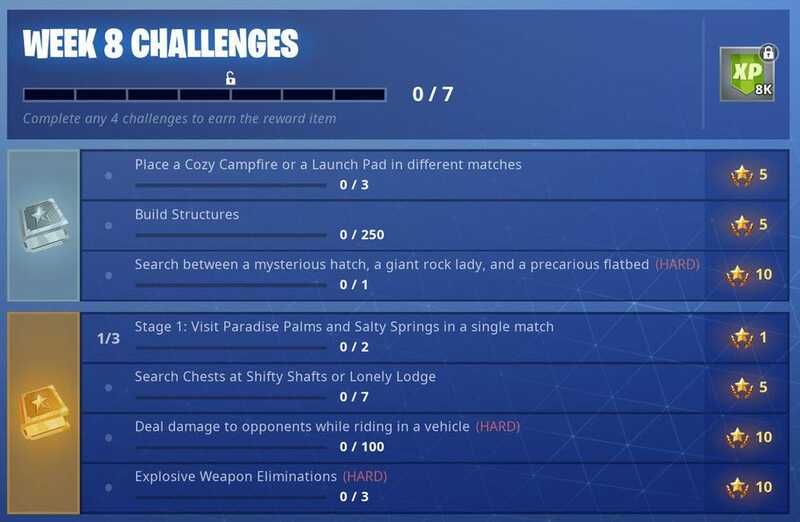 If you need any extra help with the other challenges let us know in the comments below! Ah, another “search between” challenge. These types of tasks are becoming pretty common. If you’re not familiar with this type of challenge, here’s what you need to do… Locate the 3 locations hinted in the challenge description, then head to the centre of all three of them. The fancy word for this type of searching is “triangulating” – so let’s get to it! Mysterious Hatch: You can find this strange doorway in the northeastern part of the map in the northeastern part of Wailing Woods. It’ll look like a garage door leading into the ground. Giant Rock Lady: The “Giant Rock Lady” is a crudely shaped structure made of giant stones (pictured above). You can find her just south of the edge of Wailing Woods. Precarious Flatbed: The flatbed you’re looking for is actually missing its “flatbed” in the back. Why? It’s precariously hanging off the edge of a cliff. You can find this cliff on the coast to the east of the other two locations in this challenge. That wraps up the challenges for Week 8 of Season 8. Let us know what you think of this week’s challenges in the comments below. Also join the discussion on our social media accounts: Facebook, Twitter, or Instagram. Is the Resident Evil 2 Remake the Best Resident Evil Game Ever? Esports in 2019 – 5 top tournaments to watch!